In the year since What We’ve Unlearned: English Class Goes Punk hit (digital) shelves, Writerpunk Press has been been busy. In October, we made another donation to PAWS. We are so pleased that we will be funding 2 kennels for another year and we’re already looking forward to the next visit. When a book is SO GOOD you finish it and have to suppress the urge to go back and read it all over again, right away! I am constantly FLOORED by how well the Writerpunk group does its stories. So many excellent adaptations of beloved classics… Even the ones based on works I haven’t read were excellent stories in themselves! This anthology SHINES in its excellence, truly proving that stellar literature is indeed timeless. Read more reviews on Goodreads. Amazon reviews are right here. Many thanks to fans who have taken the time to let us know what they thought! The writers, editors, artists, and automatons behind Writerpunk Press are always working on something. Our next release will take on classic horrors. Due out in May 2018. We’ve rounded up a bunch of people and prizes. All we’re missing is you! Our Ultimate Release Festival kicks off Saturday, June 4th at 7am (PDT). Come meet some authors that contributed, learn about PAWS Animal Rescue, play Poe Trivia, join contests and raffles, and grab a slice of (virtual) cake. We have some great prizes, including ebooks, paperbacks, and some crafty items. The release party will take place entirely online, so you can join us no matter where you are. Click here to RSVP, check out the line up of authors and editors, and get a sneak peek of some of the prizes. We asked and you answered! Since we want Poe Goes Punk to make a big splash on its release day, we set up our first-ever Thunderclap campaign. In a few short days, we hit our goal of 100 supporters. With a combined social reach of 114,889, news of our third release will be seen all over Facebook, Twitter, and Tumbler. If you haven’t joined yet, there’s still time. Please click above and add your support. If you already have joined our Thunderclap, thank you so much! You’ve earned an extra big slice of (virtual) cake. There’s just over 20 days left, and we would love for our social reach hit another big milestone. You can help us get there by spreading the word. The trailer for Merely This knocked our socks off and we couldn’t wait to show it off. Also, click on the image below to see which Poe tale adaptations will be included. So, is your favorite Poe tale represented? Sound off in the comments below. Tonight I’m starting a new feature which I’ve tentatively dubbed “Friday Night Interviews.” The name is short and to the point since these are interviews with various authors and staff associated with the Writerpunk press series of anthologies. These interviews will also be posted Friday night. Clever, eh? We are honored to have one of the driving forces behind Writer Punk Press and the Punk anthologies as the first entry into this new and ever oh-so-shiny feature. He is known as Jeffrey Cook and was vital to the publication of Sound and Fury: Shakespeare goes Punk (Vol 1). Jeffrey is currently continuing to push hard for our upcoming anthology, Once More Unto the Breach: Shakespeare Goes Punk (Vol II.) 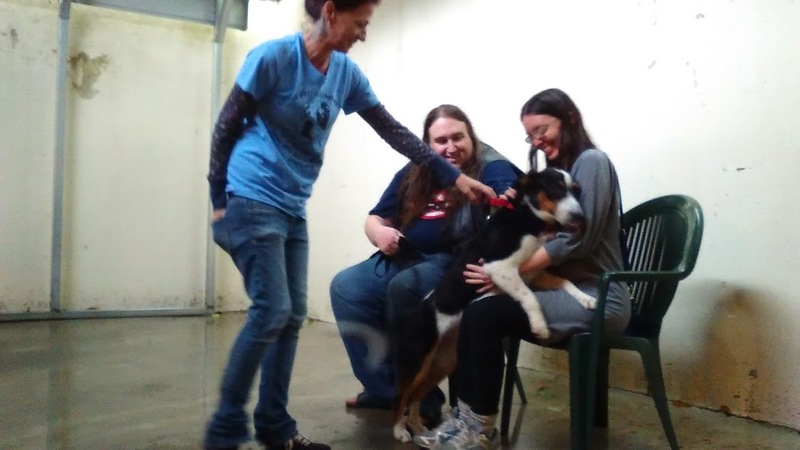 Jeffrey recently visited the PAWS center to give our donation culled from the Sound and Fury proceeds. What is PAWS and who, exactly, is Jeffrey Cook? Read on to find out! I’m a full-time independent author living near Seattle, WA. I’m 41 years old, have been married for 16 years, and I’m ‘Dad’ to 3 large rescue dogs. I have 6 books out, with #7 coming soon. They range from steampunk to urban fantasy to YA scifi/mystery. I’ve published both traditionally, and through self-publishing. I also do some tech writing here and there to help pay the bills, and some work for Deep7 games out of Seattle. How did you get involved with these Punk Anthology? What does PAWS Stand for and what is their website address? What led you to suggest PAWS as the primary charity for these books? There’s two answers to this. The first and most obvious is that I’ve always owned dogs – usually rescue dogs or pound rescuees. All of my current ‘children’ are rescues. I’m passionate about helping them where I can. My wife is of a similar mind. She volunteered for PAWS on weekends for 3 years, before we moved too far away from their center to get there consistently. As a writer – our second rescue dog from PAWS, not long after we’d finally moved into a house where we could keep dogs, was distinctly ‘my’ dog, as compared to our first, who firmly adopted my wife. After I was laid off from my job in the insurance industry, and decided to make a serious go at finally writing my first book, Khaya used to rest most of the day at my feet. When her brothers would try and interrupt my writing time, she’d ward them off, and go back to sleeping until it was break time/play time. She distinctly earned the dedication in my first novel – which was published a few months after we lost her to brain cancer. So part of what I’m doing is in her memory. The second was simply that Writerpunk is a very diverse group. When we originally discussed the charity, it was agreed we needed to find a cause with no political or religious agenda or sponsorship. 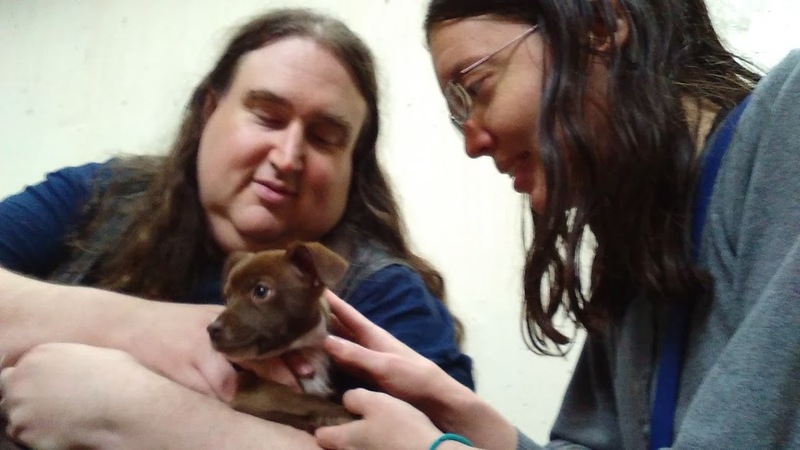 Animal charities are relatively easy to agree on that way, and after I suggested it, and volunteered to act as liaison, it ended up winning the vote of the group. Will PAWS stay the charity throughout the future volumes? For the foreseeable future, PAWS will remain the charity of choice for the anthologies. It still fits the bill, and the organization was overwhelmed by our generosity, and were happy to give us some time at the shelter, a chance to talk to volunteers and visit with the dogs, and otherwise let us see exactly what the money is benefiting. Are you more of a cat or a dog person? I’m an animal lover, but I’ve owned large dogs most of my life. I deal with cats quite well, and we’ll probably eventually help out the cat rescue too, but I get along best with big dogs. What, exactly, are the funds gathered from the first anthology used for with PAWS? PAWS allowed us to pick precisely what our money would go towards, rather than placing it into a general fund. The entire amount will go to sponsor one big dog kennel, providing shelter, food, basic medical services, toys and supervision. 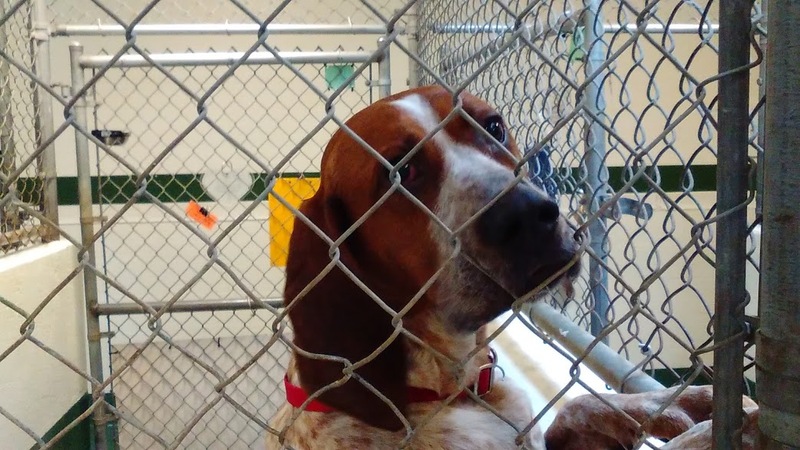 While that kennel may be used for multiple dogs over the year if some get adopted, it basically means they can house one more rescue dog at a time than they would have been able to without our donation. How did your trip to PAWS go? Tell us a bit about it. I love that place. I’ve been there before, and always enjoy going back. We ran into a couple of the dog walkers outside first and foremost, taking the dogs around the trail. These were more sedate, but I know some of their higher energy dogs also go out running with local joggers. Kay and John met us inside, and showed us to the offices, and told us a little about their mission, and let our photographer (The wonderful Chelo Felice) take pictures of the office, and Kay’s dog – an older Labrador retriever who carried his purple blanket around everywhere when moving, so he always had a comfortable place to lie down. They then showed us the cat shelter, the kennels, and the meeting areas next. I’ll touch on some of the 4-legged folks we met there in another question. 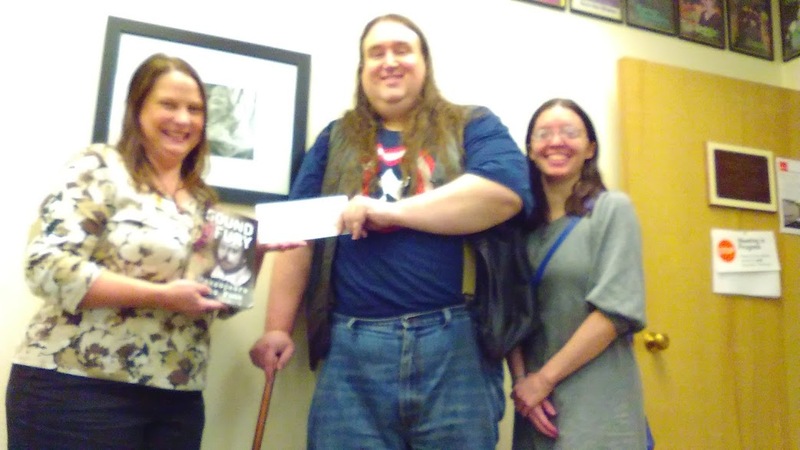 We finished there, went back to the office, donated a signed copy of the book to them, and handed over the check, along with getting some pictures with Kay and John accepting it on behalf of PAWS. Our memorial plaque will go up on the kennel door, saying that the kennel was donated by Writerpunk Press, in the next two weeks. 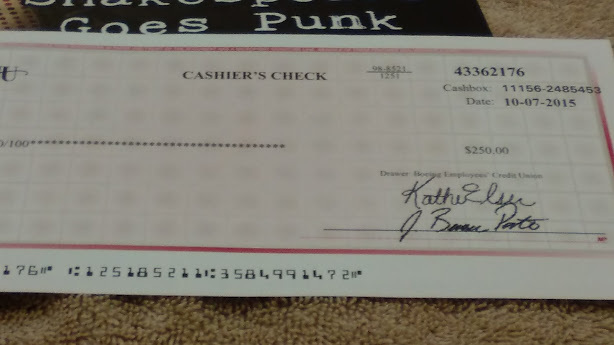 Were the staff surprised at the Writerpunk Press donation? I’d been in communication with John for a while, so they knew we were coming, and had a good idea how much we were donating. What did surprise them was that this wasn’t a one time donation, but that we intended to continue writing, and continue supporting them, and that we hoped that this check was just the beginning. After the reaction to that, I don’t think we’ll have any problems with getting future tours, bringing people up to meet the dogs, etc. Did you meet any cool and/or adorable animals while you were there? 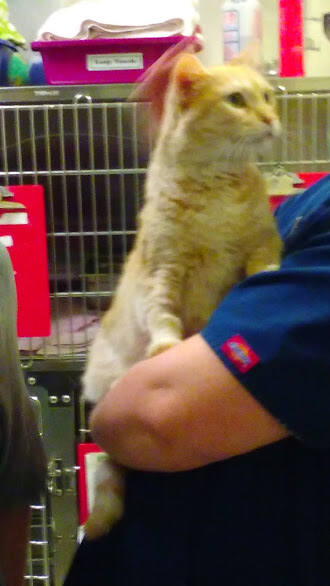 They introduced us to some of the staff, and showed us the cat shelter first – where we got to meet a few rescues, but spent the most time with Molly the Dove Cat – who purred easily and often, and sounded like a dove cooing when she did so. Molly is one of their standard ‘greeters’, because, thanks to the extensive testing, screening, and behavior testing and notes they make with all their animals, they know she does great with new people, and doesn’t get scared of groups. We got a tour of the dog kennels next. 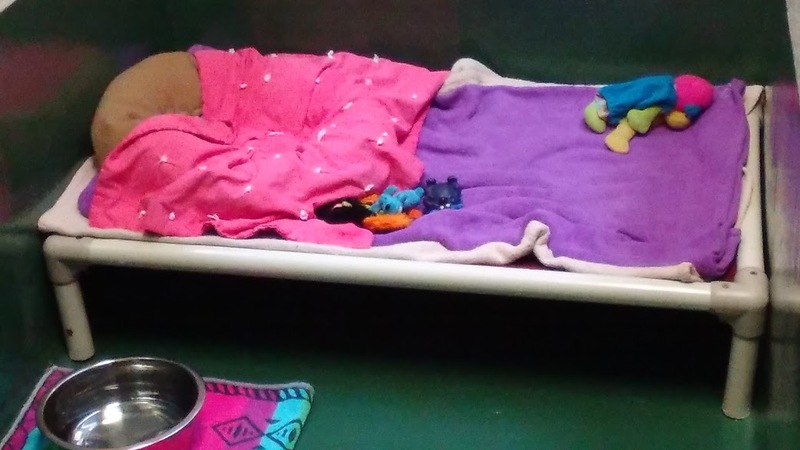 While the dogs are kept in fenced kennels, they have a fair amount of space, each gets a personal blanket and a towel, and they get to keep 1 or 2 toys that they show an affinity for in their kennels full time. Hunter, in particular, wanted to greet us very noisily, while they made sure we gave some of the newer or shyer dogs some space. They took us to the meeting area, and introduced us directly to three of the dogs – Walter the bull terrier was very happy to meet us, and to show everyone that he had an orange ball that he was very attached to. They made sure we were okay with being jumped on and licked before introducing us to Rex, a fairly new addition, who, true to warning, wanted to bounce around and kiss people. Finally, we met 8 week old Cosmo, who wasn’t quite sure what was going on, but was very sure it was exciting, going by all the wag. Do you have anything else you’d like to tell us? We have a second volume coming soon: Once More Unto the Breach: Shakespeare Goes Punk vol. II, and Merely This and Nothing More: Poe Goes Punk coming next March. We’re hoping to keep growing the list of indie authors, editors, artists, etc. that we’ve been able to help promote, as well as building up the charity brand – and, of course, hope we can do significantly more to help out a great cause soon, both in terms of the money donated, but hopefully also increasing the visibility of PAWS and the work they do. Thanks for taking the time to answer my questions, Jeffrey! I can’t wait to see future trips to PAWS via Writerpunk Press. If you want to learn more about Jeffrey Cook and his writings, head on over to his website, www.authorjeffreycook.com. and take a look. There hasn’t been a post on this website since March of this year. (2015, for those of you reading this in the far flung future.) We must apologize, but life has been very hectic for all the staff here at Writer Punk Press. However, there is good news! We wanted to start pulling the levers that open the steam vents that push gears back into motion. Our steam powered engines are revving up and a couple of different projects are scheduled to début in the near future. A sequel to our well received anthology Sound and Fury: Shakespeare Goes Punk is coming on December 1 of this year. It is called Once More Unto the Breach: Shakespeare Goes Punk Volume II. The formats will be the same as the first volume and will have several new punkified versions of classic Shakespeare stories. We will have more information as the launch date draws near. Next year we will be delving into the worlds of Edgar Allen Poe. This master of horror and mystery is receiving the same punked-out treatment that his play writing forefather received. There is no set date for this anthology, but we do have a title. May I introduce the brilliant but somewhat dark Merely This and Nothing More: Poe Goes Punk. More information on this anthology will be released as plans are finalized. We have other projects that are in the works beyond these two anthologies. More information on future projects will be announced after the two current projects are released. 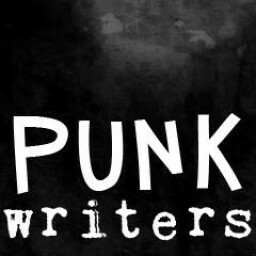 In the near future, Punk Writers will feature interviews, blog posts and other content from all of those involved with the Writer Punk anthologies. Later this week, we are honored to feature our very own Jeffrey Cook and his recent trip to PAWS. This is a trip that has been in the making since Sound and Fury was released in March. All the profits from that anthology have gone to help dogs in need through the PAWS program. Find out more information about PAWS by clicking here. 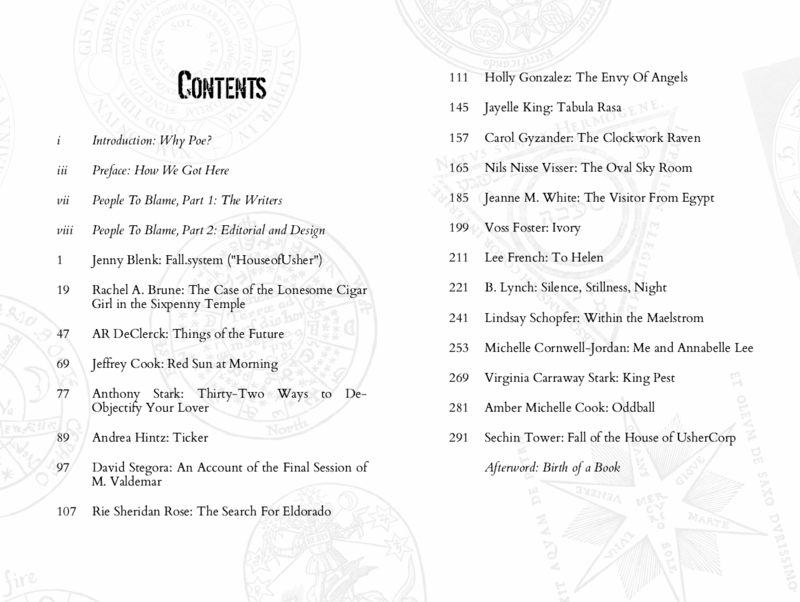 It has been an honor to see all the good things everyone has to say about our anthology. We look forward to producing more for all of you to read in the future. Keep coming back here for all the news, clues and information for our future products!